This degree course allows you to study advanced electronic design, including system-on-chip design, embedded systems engineering and integrated circuit design and layout. Core modules will develop your knowledge and skills across a range of key topics in electronic engineering, as well as giving you a foundation in the key mathematical and physical principles that underpin the subject. You’ll also have the chance to choose optional modules in specialist topics such as medical electronics, communications systems and physical micro- and nano-electronics, in line with your career plans and personal interests. You’ll be taught by expert researchers in world-class facilities, and project work in every year of the course will equip you with valuable professional skills. This degree offers you a launchpad to a wide range of careers across the electronics sector. 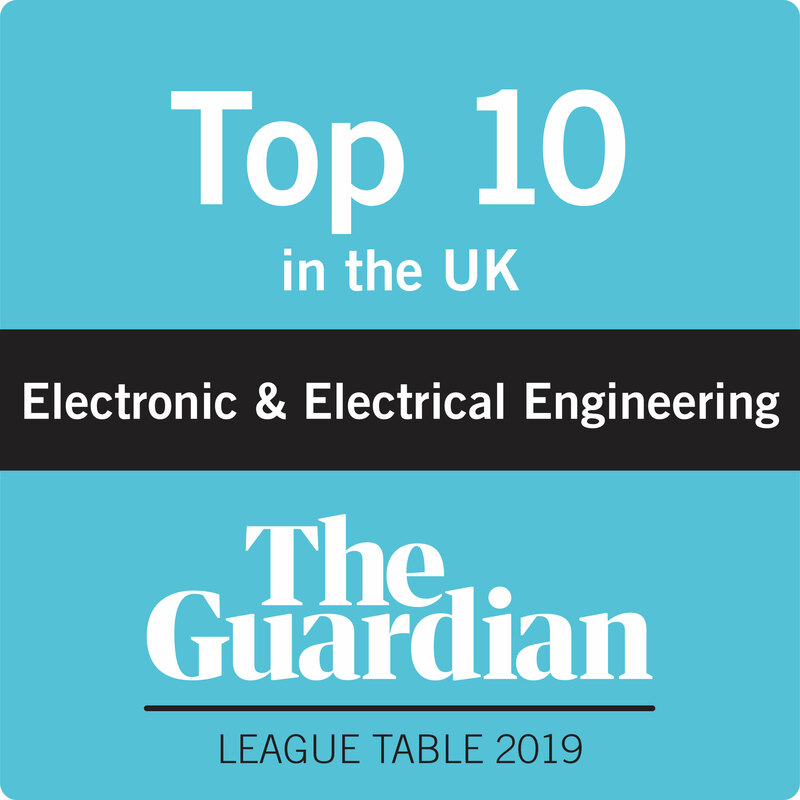 We're 3rd in the UK for Electrical and Electronic Engineering according to The Times and The Sunday Times Good University Guide 2019. You’ll have access to world-class facilities, including the ARM Embedded Systems Laboratory and the Keysight Technologies Wireless Communications Laboratory, which features professional-standard equipment including arbitrary function generators and 100MHz 4-channel oscilloscopes. For your final-year project, you could also have access to facilities such as our bionanoelectronics research laboratory, terahertz imaging laboratory, or ABB robotic arm laboratory. The MEng, BEng is accredited by the Institution of Engineering and Technology (IET) on behalf of the Engineering Council for the purposes of fully meeting the academic requirement for registration as a Chartered Engineer (CEng). The BEng is accredited by the IET on behalf of the Engineering Council for the purposes of fully meeting the academic requirement for registration as an Incorporated Engineer and partly meeting the academic requirement for registration as a Chartered Engineer. Accreditation is the assurance that a university course meets the quality standards established by the profession for which it prepares its students. For this course, these are the quality standards set by the IET. All of our core electronic and electrical degree courses have a common first two years. This lays the foundations of your studies and gives you a thorough understanding of key topics, but it also means you can easily change between these courses until the end of Year 2. You’ll learn about the physical principles that affect the function of electronic components and electrical systems, as well as circuit theory, analysis and design. You’ll also study communications systems and networks, power electronics and modules designed to improve your mathematical skills for engineering. Year 3 allows you to build on this knowledge with modules in advanced topics such as embedded systems, digital communications and microwave engineering. You’ll also take a module exploring the professional context in which engineers work today. If you continue to Year 4 for the MEng qualification, you’ll undertake a dissertation on an aspect of the industry to give you a broader understanding of electronic engineering in the wider world. You’ll also select optional modules on a range of specialist topics, from medical electronics to network security, and apply what you’ve learned to a substantial research project. Every year of the course gives you hands-on experience of project work. This gives you the opportunity to explore your subject further as well as developing valuable skills in problem-solving, communication and teamwork. You’ll benefit from our integrated style of learning and teaching. Laboratory classes, project work, and industrial visits allow you to gain first-hand experience investigating and applying material from your lectures and tutorials to real life work situations. Together they will equip you with in-depth knowledge and key practical skills that will put you in a good position to compete in science and technology-related careers. Our close links with industry also mean that you have direct contact with industry and potential employers from an early stage in your course. Our personal tutorial system will provide academic and pastoral support. You will have a designated personal tutor throughout your studies at Leeds. He or she will be an academic member of staff: you will have weekly academic tutorials with your tutor throughout your first year, in your tutor group (of typically 5 students), as well as one-to-one meetings twice per semester. In addition, our excellent student support team is based close to where you’ll work and study to help with anything from academic advice to timetabling and project submission enquiries. Most modules are assessed by more than one component. These components can include written examinations held at the end of each year, in-class and online tests, example sheets, assignments, and coursework in the form of reports, projects, presentations and posters. Extended Project Qualification - We recognise the value, effort and enthusiasm applicants make in the Extended Project, and where an applicant offers an A in the EPQ we may make an offer of AAB at A-Level (any required subjects such as Mathematics must still be at grade A). D*DD with Distinctions in all Mathematics units plus an interview and diagnostic Maths test. Mathematics units must usually include Further Maths and/or other appropriate Maths units. Some may be optional on your BTEC but are required by the Faculty. Please contact us for further information. Engineering Diploma: A (plus A level Mathematics at grade A or above). We accept a range of international equivalent qualifications. For more information contact the School of Electronic and Electrical Engineering admissions team. Suitable applicants will be invited to an applicant day, for which we strongly encourage attendance as this gives you the opportunity to meet our students, academic and admissions staff, and find out more about your course. You’ll take part in a practical electronics activity, see a taster lecture, have a question and answer session with current students, and see the School’s laboratories. The school foyer will have student projects on display so you can get an idea of what you can work towards in the future. During the day you’ll get a chance to ask questions of an academic member of staff to check it’s the right course for you and your career plans, and find out more about studying at the University of Leeds. After you apply we will send you a link to book your place on the applicant day. Please let us know as soon as possible if you cannot attend, so your place can be allocated to another applicant. Please note, if the entry requirements for your qualification include a diagnostic mathematics test, attendance at an applicant day is required. The School of Electronic and Electrical Engineering offer a range of scholarships for Home, EU and International students. All of our degrees will equip you with the skills you need to succeed in industry, including design, problem-solving, numeracy and analysis skills, together with ‘transferable skills’, such as communication and working as a team. Because of the nature of the electronics industry, the demand for high calibre electronic engineering graduates is high and wide-ranging employment opportunities exist both in large multinational corporations and small start-up companies working on next-generation products and technologies. Recent graduates have gone on to work as instrument, electronics, electrical and project engineers, as well as software engineers and developers. They’ve found roles at organisations like Babcock, BAE Systems, BP, Imagination Technologies, Masternaut Ltd, Mentor Graphics, Parsons Brinckerhoff, QinetiQ, Radio Design Ltd, Rolls Royce and Tata Steel Europe. If you choose to take the MEng course, you can apply to spend your third year studying at a university overseas. We’ll advise you on finding a university of your choice, which will need to offer similar modules to the ones you would study in Leeds, and the Programme Leader will approve appropriate matches. With the help and support of our faculty Employability Team, you can choose to undertake a placement at one of the 100+ companies that we work with. If you decide to undertake a placement year, this will extend your degree by 12 months and on successful completion, you will be awarded the ‘industrial’ variant in your degree title to demonstrate your unique expertise to future employers.